David Green. Picture by South Yorkshire Police. A driver under the influence of cannabis who fled and left his three injured friends in the wreckage of his car has been jailed. David Green, aged 21, was sentenced to two-and-a-half years behind bars after admitting his role in a life-threatening collision in Shafton, Barnsley, in January. 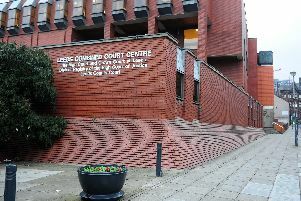 Green, of Havercroft, Wakefield, pleaded guilty to three counts of causing serious injury by dangerous driving during a hearing at Sheffield Crown Court. He also admitted driving without insurance, driving without a licence, failing to stop at the scene of a collision, failing to report a collision and failing to give information about the identity of a driver involved in a collision. The court heard that Green, now disqualified from driving for three years after his release from prison, crashed a blue Peugeot 106 on Sandybridge Lane, Shafton, when he lost control on a bend and went down an embankment. He fled, leaving his three injured passengers behind, and was arrested two days later. PC Andy Brown from South Yorkshire Police's serious collisions unit said: “Green has accepted responsibility for his reckless and dangerous actions that night, which injured three teenage boys. “Green chose to drive dangerously whilst under the influence of cannabis. By handing himself in to the police when he did he knew he would be under the limit regarding his drug use. “Rather than remaining at the scene and helping his friends, he decided to show off to his friends on a freezing night rather than driving in a sensible manner appropriate to the conditions. “One of the teens, a 17-year-old boy, suffered life-threatening injuries that have had a lasting impact. All three were released from hospital and are recovering well, but their lives were changed that night.